Welcome to AlphaTouch™ - the easiest, most portable video-intercom platform ... PERIOD. When an AlphaTouch™ system is first ordered, our factory engineers begin to program your devices according to your specifications. We will set up an account for your installation, provide permissions to account managers and populate any building and resident information we are provided with. Once programming is completed, your system is shipped to your location. There is no on-site programming that is needed during your initial installation, outside of perhaps tweaking some settings to your liking and to your particular environment. 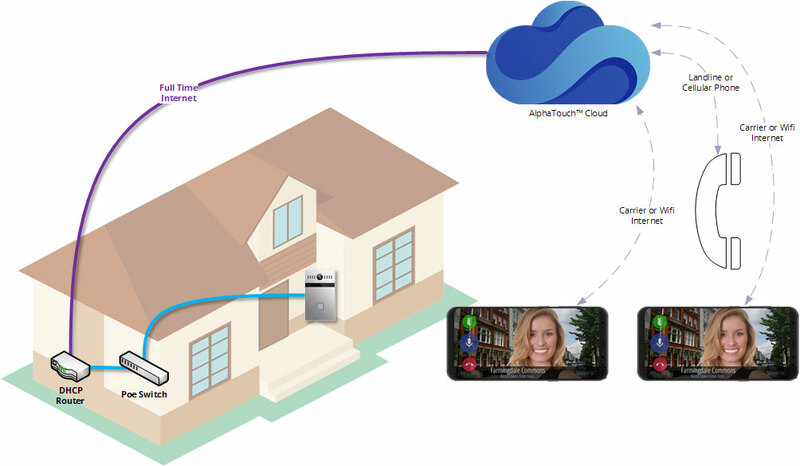 Once the AlphaTouch™ devices are connected to an Internet-Enabled PoE (Power Over Ethernet) network they will come to life, connecting to the AlphaTouch™ cloud services and they will download all of the programming data that is required. If you're not sure which system components you will need for your application, you have several options. Use our online system-builder. Just answer a few simple questions and you will be presented with a list of components, related documentation and the ability to get equipment pricing. Contact our highly-trained sales staff. We are standing by to assist you in putting your system together. NOTE: The following illustration is NOT a wiring diagram! It is designed to visualize the system data structure! As a resident, you can enjoy a variety of features when your building uses AlphaTouch™. This area will guide you through these features and provide full details on all functions and options. In order to sign in to your AlphaTouch™ account, you will need credentials, which consist of your email address and password. When your email address is first associated with a system resident, a random password will automatically be emailed to you at that email address. From this point forward you will be able to sign in to your AlphaTouch™ services. If you have residency in more than one AlphaTouch™ apartment, you will have access to your AlphaTouch™ services as it relates to any and all of those apartments from this login, assuming you use the same email address with all of them. Mobile Apps are currently available for Android and iOS devices. Once you sign in to your mobile app, you will have some basic functionalities, but the most important one is that you will immediately begin receiving calls to your app whenever you have a visitor call you from a door camera panel. You will have the ability to answer the call with 2-way IP audio for crystal clear voice communication. 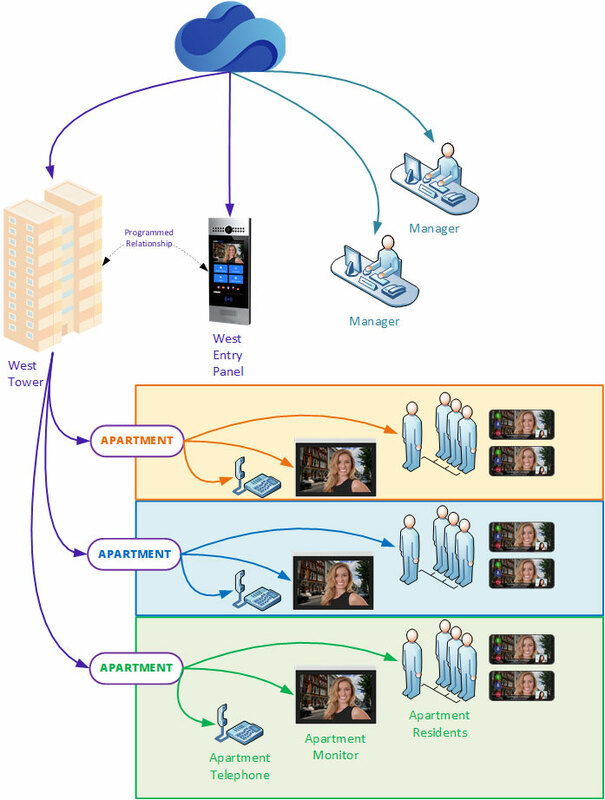 You will also receive real-time streaming video of your visitor as you speak to them. 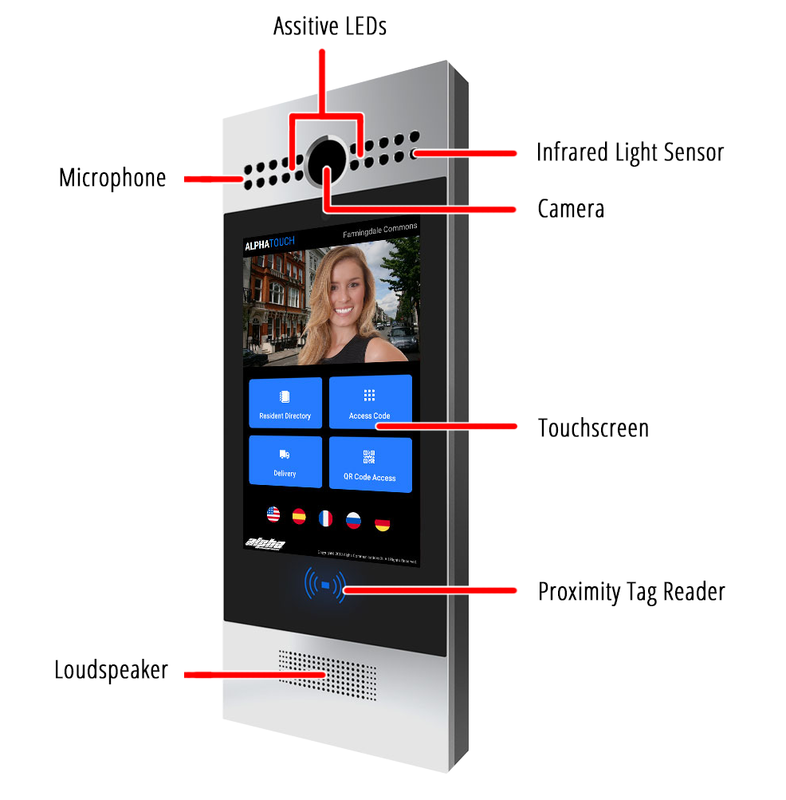 If the call is being placed from a door camera panel that has a screen, you will also have the option to answer the call and share your video for 2-way video communications. Note: You'll want to make sure you know your AlphaTouch login credentials. This information would have been emailed to you when management added you to their system. If you never received this email, please contact management and ask them to ensure your email address is specified and correctly entered. If you can't recall your login information, please use our password reset utility. Please follow the links below to download the appropriate app for your device and proceed to its corresponding help section. The first time you open the app, you'll be prompted to sign in to AlphaTouch. Submit your email address and password. In the initial release of the app, there's not much else to do at this time until you receive a call. There will be more features coming soon. Stay tuned! 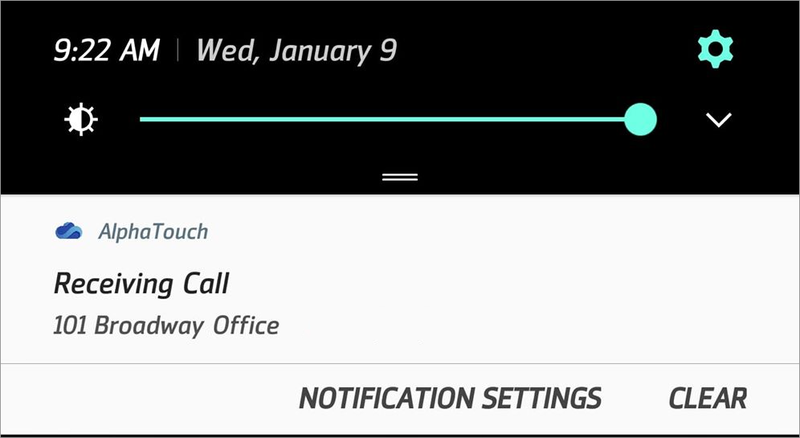 When a call is placed to you, you will receive a push-notification on your phone. To see who is calling you, click on the notification. The AlphaTouch app will open and present you a live audio and video of your visitor. You can either Accept or Decline the call at that time. When you accept the call, your audio will be turned on and you will be able to speak to your visitor. Optionally, you can also click the icon to turn your outgoing video stream on in order to allow your visitor to see you too. Once you've anwered a call, you can click on the door release button to activate a door release action. Detailed event logs with image capture. Updating your resident listing, phone number, email address and building access code. Send your visitors QR Codes that they can use to gain entrance to your building. Please note: Management has the abilitiy to disable some of these features. You can sign in to the AlphaTouch™ website by clicking the "Sign-In" button at the top of this page. Changing any of these fields will change your settings as it relates to that particular apartment only. For example, perhaps a person has a residence as well as a commercial office in the same building. You might want the resident name to be "Smith, Bob" as it relates to your residential space, but for your commercial space you might want "Dr. Smith MD". Resident First Name & Last Name: This is the name that will appear on any door camera panels and directories for each apartment you belong to. Management will specify how your name is formatted (for example "[first name] [last name]" or "[last name], [first name]". Resident Email: This is the email address that is associated with your resident listing for each apartment you belong to. Please note that it is very important that all of your resident listings share the same email address if you wish to access all of them from a single login and wish to receive video calls from all of your apartments to a single mobile device. Resident Phone Number: This is the phone number that is associated with your resident listing in each apartment you belong to. This can be a standard landline number, a cell phone or virtually any other phone number. Send SMS Alerts: If the phone number you've entered is a cell phone and can receive SMS text messages, we suggest enabling this option. This will allow us to send you notifications when a call is missed or when a visitor arrives using a temporary QR Access Code you've issued them. Proximity Tag Code: If proximity tags are enabled for your installation, this code will be specified by management and can not be changed. You can, however, see whether or not you have a proximity tag associated to you or not. Resident Access Code: If management has this feature enabled, you can specify an alphanumeric access code that can be used to grant yourself access to your building from any touchscreen door camera panel at your building. AlphaTouch™ gives you a tool to generate a new secure, unique access code if you can not think of one. Having a party? Expecting a visitor for a stay? You can provide your guests with their own personalized Visitor QR Access Codes. The QR Code can be sent via email or SMS text message to your guests and they can use it at any door camera panel for your building. They only need to hold the QR code up to the panel's camera to gain access. Unlimited Use﻿: All recipients that receive this QR Code can use it as many times as needed as long as it is within the specified date/time range. One Use per Visitor: Each recipient that receives this QR Code can use it once at any time, as long as it is within the specified date/time range. There will be a grace period of 5 minutes, in case your visitor (for example) forgot something in their car, they can quickly run out and use their code to regain access to the building. Specify whether or not you would like to be notified when your guest(s) arrive. Since each visitor will receive a slightly different version of ths QR Code, the system will know which one of your visitors has arrived when a QR Code is used, and can alert you right away. Specify which residence you wish to Allow Access To. This is the apartment or unit that you are granting visitors access to. This will dictate which door panels will accept the QR Code as valid - any door panel associated with the building your residence is in will recognize the codes. Please note that the management at your various residences may disable this feature. Those residences will not appear for selection and QR Codes can not be created for them. Specify the date/time range that this QR Code will be valid for. By default, Visitor QR Access Codes can be valid for a maximum of 2 weeks, but that limit can be adjusted by management. Once your new QR Code is created, you can click the Share button to send this QR Code to your guests. You will be presented with a large text box to enter your guests' contact information. Once you have entered your guests as outlined below, click the Share button. Each guest receives their own unique QR Code Image. It is important that your guests do not share their QR Codes with one another. If they do, AlphaTouch™ will not be able to properly alert you to who is arriving. Enter one (1) email address or sms phone number per line. Optionally, you can also add the guest's name to the line (separated from the email address or phone number with a comma). This will associate a name with the QR Code that is sent to each guest. If you do add names to your share list, and you specified that you want to be notified of guest arrivals, your notification will include that guest's name. Your building QR access code has been used by Visitor (phone: 631-555-1212). Upon completion, click "Share QR Access Code". A unique QR Code will be sent to each of your visitors by SMS text or email, depending on the type of contact information you entered. Once you've shared your Access Codes with your visitors, there are two ways to revoke access. Next to the QR Code listing, you will see text telling you how many visitors you've shared the code with. That text is a clickable link that allows you to view the visitors that have been invited. You can individually remove a visitor from the list. They will be sent a notification that their access has been revoke immediately. You can Delete the Visitor Access Code entirely. This will revoke access from all of the visitors you've included on the invite. Your Event Logs﻿ show you a complete listing of all system actions related to you and your residences. You can see what actions took place, when they took place and even view a snapshot image of the event (if applicable). Whether you are a professional installation company, or a home-owner performing a DIY upgrade, you will find AlphaTouch™ to be extremely simple. The only real prerequisite for AlphaTouch™ is that all locations where devices will be located must have access to an Internet-Enabled PoE (Power Over Ethernet) network. 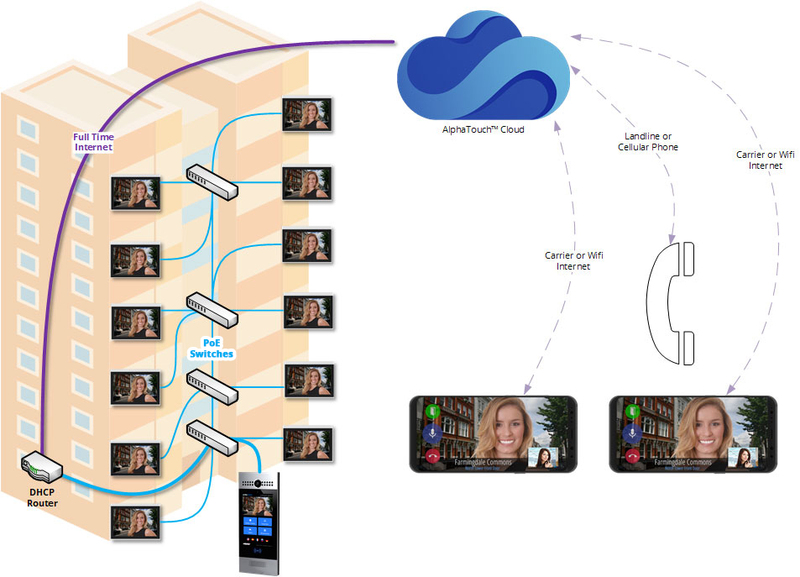 They do not even need to all be connected to the same network, as long as all of the networks involved can reach the AlphaTouch™ cloud services via the Internet. 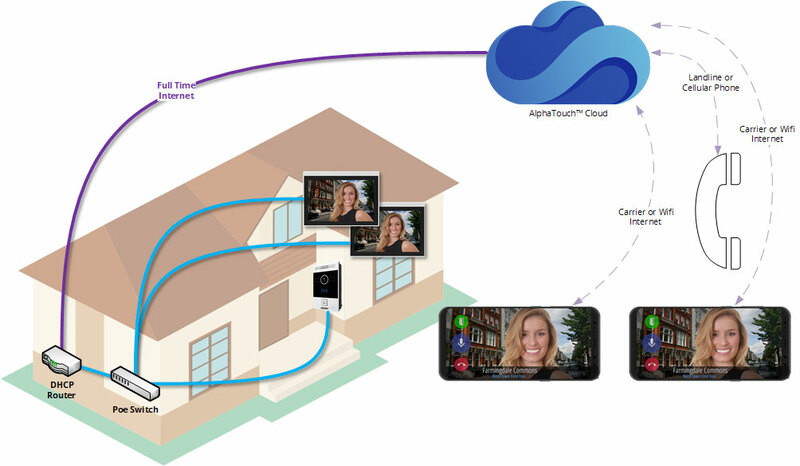 INTERNET: AlphaTouch™ Devices require a prompt and reliable Internet connection for best video call quality. The property management is responsible for acquiring & maintaining this service. 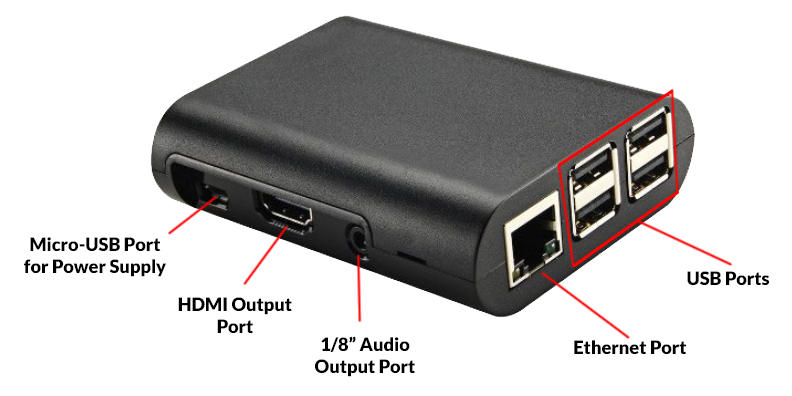 Please ensure a wired Internet-Enabled PoE network connection to each AlphaTouch™ Device. NETWORK: AlphaTouch™ Devices require that data and power be delivered through a PoE-enabled network. The Devices require a minimum of 13 Watts to function. By default, Devices require a DHCP-Enabled network environment in order to obtain an IP Address. Static IP addresses can be assigned at the time of your order. 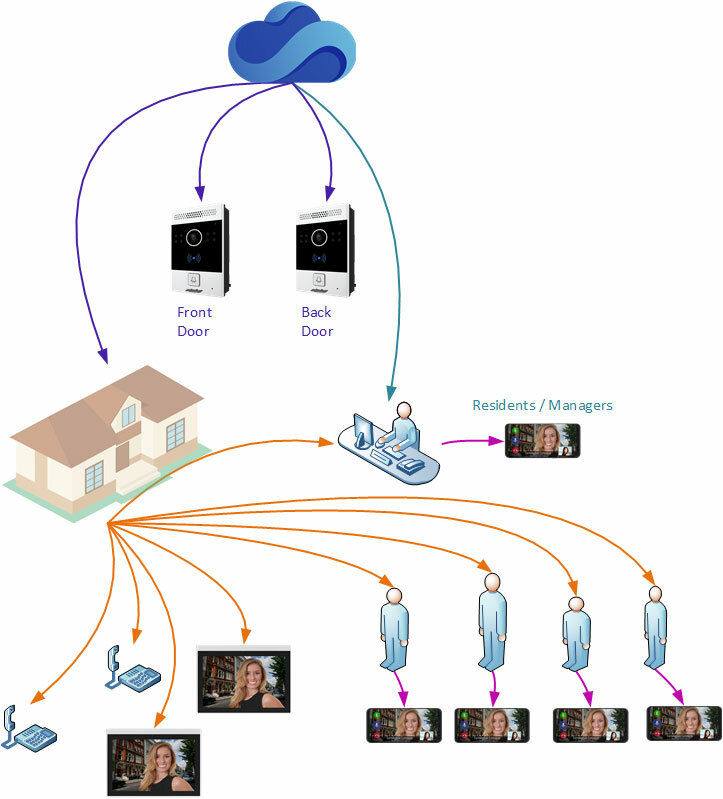 For single-unit buildings, such as single-family homes, AlphaTouch™ is an extremely simple solution to give you mobile video intercom capabilities. 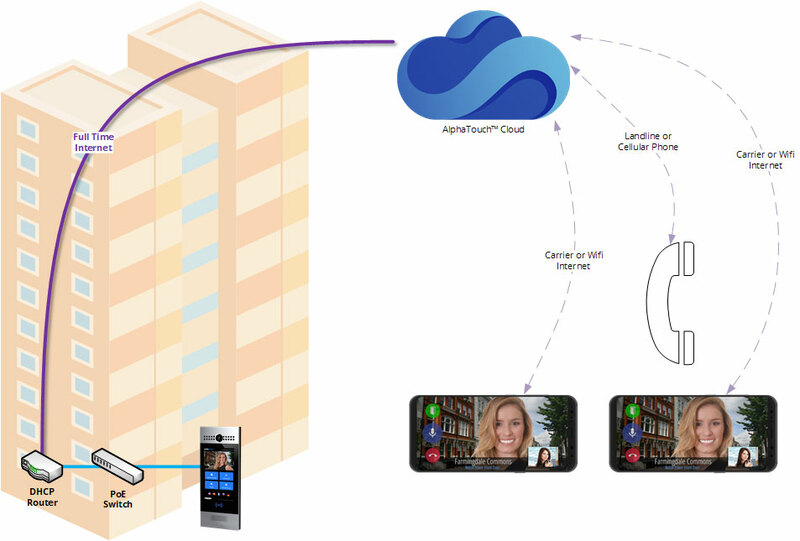 With the press of a single button, AlphaTouch™ can simulataneously dial your home phone number and call all of your family members' mobile apps. The first one to answer the call gets it and the call notifications are cancelled everywhere else. Below is a typical system layout for this scenario. You will notice that the entire system is comprised of a 1-button Entrance Call Panel placed at the door that is wired with a standard networking cable to an Internet-Connected PoE Network. This provides the Entrance Call Panel with power as well as a communication path to the AlphaTouch™ cloud. Once that has been established, the Entrance Call Panel can place telephone and app calls to your existing smart mobile devices and telephones. This is a perfectly good application of the system, for those who wish to be contacted on their telephone and mobile devices only... however some applications may also require hard-wired monitors throughout the house. Luckily, this is easy enough. Our monitors simply connect to the same Internet-Connect PoE hardware as the Entrance Call Panel. Below is an illustration showing this. Alternatively, it can be connected to an entirely separate Internet-Connected PoE Network. For multi-unit buildings, such as apartment buildings, campuses, and office buildings, the layout is virtually identical to that of a single-unit building. The only difference is that this application uses a 7.0" touchscreen directory panel which is capable of listing a virtually unlimited number of apartments and residents. With just a few presses on the touchscreen, AlphaTouch™ can simulataneously dial multiple phone numbers and mobile apps (with video) for all of the apartments and residents. The first one to answer the call gets it and the call notifications are cancelled everywhere else. Below is a typical system layout for this scenario. You will notice that the entire system is comprised of a 7.0" tocuhscreen Door Camera Panel which is placed at the door and is wired with a standard networking cable to an Internet-Connected PoE Network. This provides the Entrance Call Panel with power as well a communication path to the AlphaTouch™ cloud. Once that has been established, the Door Camera Panel can place telephone and app calls to your existing smart mobile devices and telephones. Again, there are also many applications that require hard-wired monitors throughout the building(s). Luckily, this is also easy enough. Our monitors simply connect to the same Internet-Connect PoE hardware as the Door Camera Panel. Below is an illustration showing this. Alternatively, they can be connected to entirely separate Internet-Connected PoE Networks. Managing your AlphaTouch™ system is as easy as logging into the Cloud and making your changes. All connected devices will be updated virtually instantly when a change is made that impacts them. Your initial system programming can be done by our factory professionals at no additional cost. That's right - every device on your system will be pre-programmed according to your custom specifications. In fact, some of the programming MUST be done, since we will need to associate your installation to its first manager so someone can sign in to make changes. Full company contact information for the installing company (if applicable). Full company contact information for the management company (if applicable). What is the name of this installation? If the installation consists of a single building, the installation name might just be a building address like "101 Broadway New York" or it can be the building name like "Alpha Tower"
If the installation consists of several buildings (like a campus, a group of apartment buildings or condo complexes), we suggest using a name that represents the entire group of buildings like "Alpha Towers" or "Apartments at Elwood"
What is the name and address of the building (or buildings)? If the installation consists of a single building, please provide the building's name. The building's name might just be a building address like "101 Broadway New York" or it can be the building name like "Alpha Tower". In this case, making the Installation Name the same as the Building Name is suggested. When those names are the same, one of them becomes hidden when being displayed as to not be redundant. If the installation consists of multiple buildings, please provide us a clear list of all building names. In either case we need a full physical address of each building in the installation. What are the Apartment/Unit/Location Labels? For each building in this installation, please provide a list of apartment/unit/location labels. This is basically a list of all unique locations in the building(s) which will be called (like a residential apartment or a concierge location). Each of these locations can also have its own telephone number assigned to it that will be used if a visitor wants to contact all residents at that location. What is the resident information? For each apartment/unit/location, please provide a list of residents. Each resident can have a name, a phone number and an email address. The phone number is used when a specific resident is called and their email address will be used to send them a login password. Once you sign-in, you will be able to make system changes on your own. First, you may need to select which installation you wish to modify. If you only manage one installation, you will be brought to the management area for that installation. If you manage more than one installation, you will be presented with a list of your associated installations. Click the one you want to manage, and you will be brought to the management area for that installation. Once you've selected the installation you wish to manage, you'll see the management menu appear on the left hand side of the screen This menu will be collapsed for mobile users, so if you don't see it, click the Menu (﻿) button. In the following help sections, it is assumed you've already chosen the installation you wish to manage! Now that you are ready to start managing your installation, we must make sure there are buildings within it. The buildings in your installation will house all of the apartments (or units), as well as their associated residents. NOTE: You must have appropriate "Building" permissions to view, add, edit or delete buildings. NOTE: Custom terminology settings might cause the terms "Building" and "Buildings" to appear as something else. For example, "Buildings" may have been renamed to "Facilities" - The following help section will apply, in that case, to facilities. To view the buildings in an installation, click Buildings in the left-side menu. Click Add a New Building. This address will be validated against the Google Maps services. If it does not come back as a valid address, your new building will be rejected. If the address does not come back as expected, please edit the building (see next section) and try again with additional or more accurate information. Once you're done, click Add Building. You are now ready to start adding your apartments to this building. See Managing Apartments for more information. Click the drop-down menu icon ( ) for the building you wish to edit. Modify the building name and/or address in accordance with the requirements listed previously in the "Adding a New Building" help section. Once you are finished, click Save Building. You will be presented with a confirmation dialog to ensure that you truly wish to delete that building. IMPORTANT: Deleting a building will delete all building apartments, apartment residents, apartment settings, and resident settings. In rare cases, this can be reversed by our technical team, but for the sake of safety, assume we cannot -- and that this change is, as stated in the dialog box, non-reversable. Once you have verified that you wish to delete the building. confirm that by clicking Delete Building. Apartments are entities which house your installation residents. You will need to create all of the apartments in your building that residents will be occupying. Please note that the number of apartments in your installation will, at least in part, determine your monthly charges. NOTE: You must have appropriate "Apartment" permissions to view, add, edit or delete buildings. NOTE: Custom terminology settings might cause the terms "Apartment" and "Apartments" to appear as something else. For example, "Apartments" may have been renamed to "Suites" - The following help section will apply, in that case, to suites. To view and/or manage a building's apartments, click Buildings in the left-side menu. Locate the building you wish to view the apartments for. When viewing the list of building apartments, Click the add icon ( ) in the top toolbar. Adding Single Apartments: You will be asked for an apartment label for each apartment you wish to add, one at a time. When one is submitted, you will then be prompted for the next one until you uncheck the checkbox labeled: Add Another Apartment After This One? Bulk-Adding Apartments: You will be asked how many apartments you wish to create. They will be created for you with randomized labels. Once you've added your apartments, you will see them listed on the left-hand side of your screen in the apartment list for the building. In the apartment list, click the title/label of the apartment you wish to edit. The right-hand side of the screen will update with the apartment's associated settings. This is a tabbed interface that will default to the Settings tab. Apartment Phone Number for apartment calling as opposed to resident-specific calling. Hidden apartments are useful for providing access codes for people you do not wish to list on the directory, such as a mail carrier. Priority Display apartments are alphabetized and listed at the top of the directory before all of the non-priority apartments. Apartments which are Alphabetized Normally will be alphabetized and listed below any priority apartments. 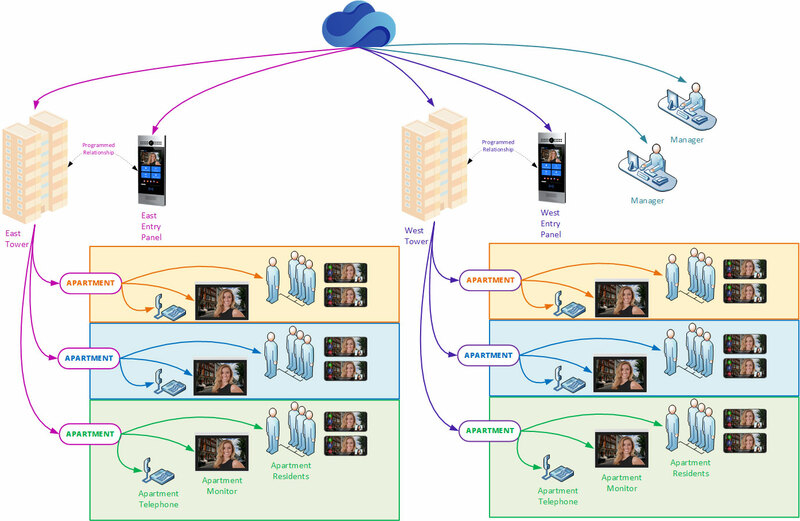 All-Call Functionality. Enabling this option will cause all residents in the apartment to be called when a call is placed to the apartment. If disabled, only the apartment phone and/or monitors will be called. When you are done modifying these settings, click Save. In the apartment list, place a checkmark next to each apartment you wish to delete. Once you've selected the apartment(s) you want deleted, click the Delete Selected () icon in the top toolbar of the apartment list. You will be presented with a confirmation dialog to ensure that you truly wish to delete the selected apartments. IMPORTANT: Deleting apartments will delete all apartment residents, apartment settings, and resident settings for those apartments. In rare cases, this can be reversed by our technical team, but for the sake of safety, assume we cannot -- and that this change is, as stated in the dialog box, non-reversable. Residents are entities which live in your apartments. If you wish for each resident to be able to use the AlphaTouch™ mobile apps, or to be contacted individually (apart from the general apartment contact), you must add each resident to their appropriate apartment. If any resident lives in more than one apartment, simply add them to both apartments, but use the same email address to link both apartments to that resident's mobile app. NOTE: You must have appropriate "Resident" permissions to view, add, edit, email or delete residents. NOTE: Custom terminology settings might cause the terms "Resident" and "Residents" to appear as something else. For example, "Resdients" may have been renamed to "Tenants" - The following help section will apply, in that case, to tenants. In the apartment list, click the residents icon () next to the apartment you wish to view the residents for. The right-hand side of the screen will update with the apartment's associated settings. This is a tabbed interface that will default to the Residents tab. Alternatively, you can click the apartment title and then click the Residents tab. Click the icon in the upper-right hand corner of the Residents tab. Specify a Resident Name. Enter the name as you want it to appear (and be sorted) on any directories. Optionally, Specify a Resident Phone Number. If specified, this phone number will be dialed when the resident is individually contacted. In a telephone-entry type of installation, this will typically be that resident's cell phone. Send SMS Alerts: If this phone number can receive SMS text messages, enable this option so the resident can receive alerts, such as visitor arrivals. Part of their app/website login in addition to a password. Linking residents to other AlphaTouch™ enabled properties using the same email address. Sending the resident notifications they've opted in to. Leaving this field empty essentially disables apps for this user in this installation. Proximity Tag Code: If the resident will have a resident tag assigned to them, enter the tag's code. If you wish to add an additional resident after the current one, place a check in the checkbox labled "Add Another Resident After This One?" Once you are finished, click Add Resident. If the Installation has Resident Access Codes enabled, the new resident will be assigned a unique access code. Adding a new resident with an email address will cause an email to be sent to them letting them know they've been added as a resident to an AlphaTouch™ installation. This email will include their personal access code (if enabled). If the email is brand new to the AlphaTouch™ cloud, and initial password will be generated for that email address and the email will also include their new login credentials. If the email is recognized from another AlphaTouch™ installation, the email will let the resident know that their new installation/property is available under their existing account. Click the name of the resident you wish to modify. Modify the resident name, phone number and/or email address in accordance with the requirements listed previously in the "Adding a New Resident" help section. Please note that modifying a resident's email address may cause their app/website logins to stop working. It may also break any links there between a resident's properties. You can also modify the resident's access code if their existing code has become compromised. There is a tool provided that will generate a unique new code for that resident if you wish to use it. Once you are finished, click Save Resident. Click the button next to the resident you wish to delete. You will be presented with a confirmation dialog to ensure that you truly wish to delete that resident. IMPORTANT: This resident will no longer see this property in their app/website portals. Once you have verified that you wish to delete the resident. confirm that by clicking Delete Resident. Click the button next to the resident you wish to move. Select the apartment you wish to move the resident into. Their current apartment will not be shown. The resident will be relocated to the new apartment, leaving their phone, email and access code settings in tact. Click the button next to the resident you wish to send a reset link to. The resident will receive an email with a link they can click to specify a new password. They can click the link to do so, or ignore it to maintain their current sign in password. Note: This button will only be visible if the resident has an email address. Door / Entry Panels are entities that belong to an intallation. They are physically placed at a point of entry (like a door or a gate), and provide a way for visitors to call residents or building staff. NOTE: You must have appropriate "Hardware" permissions to view, add, edit or delete Door/Entry Panels. 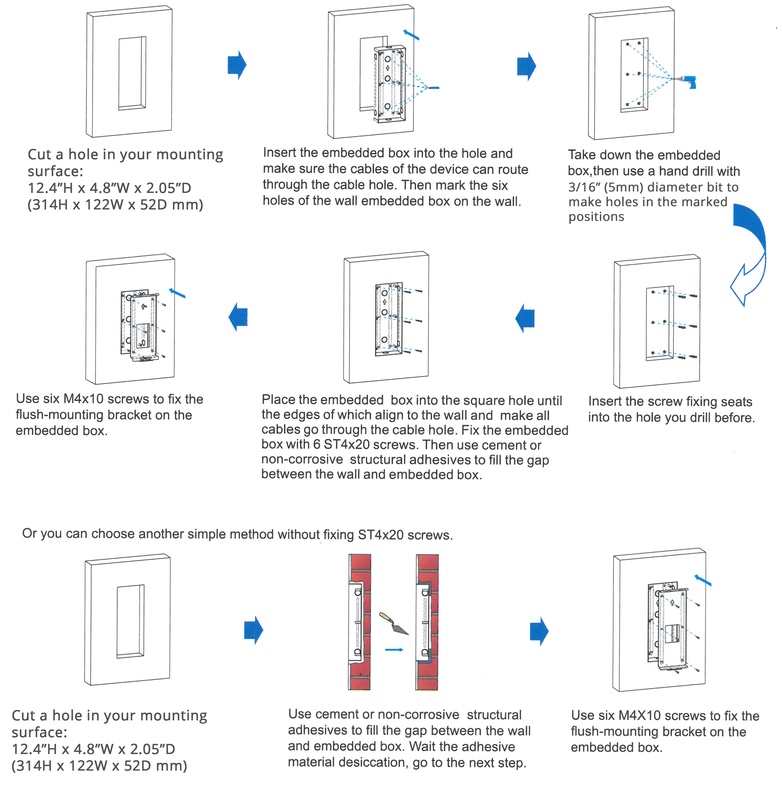 To view the door/entry panels for an installation, click Door Panels in the left-side menu. Click Add a New Door/Entry Panel. This is just a general name for the location where the device is located, such as Front Door, Service Entrance or South Entrance. It will be used on notifications for events that take place there. Specify a Panel MAC Address. This is Vital. The MAC address is how the cloud knows which device is which, and how to program it. For Push-Button Panels, you should also, at minimum, set the apartments to call for each "Custom Call Button" on your panel. Failure to do so will cause the unset buttons to be non-funcational. For Touchscreen Directory Panels, you should also, at minimum, select one or more "Buildings To Display". Failure to do this will result in a blank directory. The use of custom call buttons is optional. Once you're done, click Add Panel. NOTE: You must connect the panel to the cloud within one hour of creating it. This is the only way the panel can download its required credentials. Click the label of the door/entry panel you wish to modify. Modify the door/entry panel name and other settings in accordance with the requirements listed in that device's help section. Once you are finished, click Save Panel. Click on the drop-down menu icon ( ) next to the door/entry panel you wish to delete. IMPORTANT: Deleting a door/entry panel will remove all of the settings associated with it. The panel can be re-added later on, either to the same installation or a different one. Once you have verified that you wish to delete the door/entry panel. confirm that by clicking Delete Panel. NOTE: You must have add/edit hardware permissions in both the source installation as well as the destination installation in order to perform this task. In the resulting dialog box, select the installation you wish to move the door panel to. A new Panel will be created with the prefix "Copy of " added to the original Panel's title. Click on the button next to the door/entry panel you wish to reboot. The reboot command will be sent to the door/entry panel, and the panel will reboot itself. Note, the door/entry panel will be unusable during this brief reboot. The reboot button become disable and will spin () until the panel is finished rebooting. Administrators are people who can access certain settings for an installation by signing in to the AlphaTouch™ cloud. You can add as many administrators as needed to perform maintenance functions. NOTE: You must have appropriate "Administrators" permissions to view, add, edit or delete administrators. To view the managers for an installation, click Administrators in the left-side menu. Installation Permissions: Permissions regarding the ability to view and edit installation settings. Building Permissions: Permissions regarding the ability to view, edit, add and delete buildings. Apartment Permissions: Permissions regarding the ability to view, edit, add and delete apartments. Resident Permissions: Permissions regarding the ability to view, edit, add, email and delete residents. Managers Permissions: Permissions regarding the ability to view, edit, add and delete other managers. Hardware Devices Permissions: Permissions regarding the ability to view, edit, add and delete hardware devices such as door/entry panels and apartment monitors. Billing Permissions: Permissions regarding the ability to view and modify billing-related information, including subscriptions, add-ons, invoices and other basic billing functionalities. Logs Permissions: Permissions regarding the ability to view installation event logs. Click the Add Administrator button in the upper-left hand corner of the Administrators List. Specify a Administrator Email Address. Specify the new Administrator's Permissions. Once you are finished, click Add Administrator. Please Note: Adding a new administrator will cause an email to be sent to them letting them know they've been added as an administrator to an AlphaTouch™ installation. If the administrator's email address is brand new to the AlphaTouch™ cloud, and initial password will be generated for that email address and the email will also include their new login credentials. If the administrator's email address is recognized from another AlphaTouch™ installation, the email will let the administrator know that their new installation/property is available under their existing account. Click the name of the administrator you wish to modify. Modify the administrator permissions as required. Click the button next to the manager you wish to delete. Once you have verified that you wish to delete the manager, confirm that by clicking Delete Manager. Click the button next to the administrator you wish to send a reset link to. The administrator will receive an email with a link they can click to specify a new password. The settings area contains various settings that apply to your entire installation. That means these settings will be reflected on all Buildings, Apartments, Resident, Hardware Devices and any other entity across your installation where applicable. NOTE: You must have appropriate "Installation" permissions to modify installation settings. If the installation consists of a single building, the installation name might just be a building address like "101 Broadway New York" or it can be the building name like "Alpha Tower". If the installation consists of several buildings (like a campus, a group of apartment buildings or condo complexes), we suggest using a name that represents the entire group of buildings like "Alpha Towers" or "Apartments at Elwood". This is the default language used when creating new devices and other items. This setting can always be on a per-device or per-entity basis. Specifying the timezone of your installation will help us synchronize times between the cloud services and your local time. Times shown on the website and app may be inaccurate if this is not set correctly. If enabled, AlphaTouch™ will assign a random access code to your residents that they can use to let themselves into the building. This code can be changed by management or the resident themselves. If enabled, residents will be able to modify their own access code. Enabling this feature will allow building residents to send their visitors, through email or SMS text, temporary QR Codes that they can use at appropriate door stations to grant themselves access to the building. Specify how long temporary Visitor QR Access Codes can last in order to avoid abuse by residents. You can change certain phrases that are used for your installation. For example, an office building might change the term "Residents" to "Tenants" -- this will make future changes easier, as the terminology used is adapted to each particular installation. Specify whether or not you want to automatically send residents their login credentials when they are created. If you do not automatically send them upon creation, they can be batch-sent later on. How you want apartments to be displayed on the directory when they are created. This setting can always be changed on a per-apartment basis if needed. This is an area which allows managers to maintain subscription and billing information. NOTE: You must have appropriate "Billing" permissions to view or modify subscription or billing information. To view the subscription and billing information, for an installation, click Subscription in the left-side menu. The top section of this page will show your general subscription information. Total monthly charges based on your current counts and configurations. You can keep any number of credit cards on file for your installation. This is where they will be listed. You must have at least one valid card on file at all times to ensure there is no interruption in your AlphaTouch™ services. Click the Add a Payment Method button or icon. You will be presented with a credit card submission form. Please fill this form out with the credit card number, expiration date, and security code. Please also provide the billing name, email address, phone number and street address. The card data will be validated and you will be altered to any issues as you type it. Once the form is filled out, click Add This Card. Note: If you have no saved payment methods, adding a credit card will automatically set this card as your default "Monthly Service Card" that gets charged each month for your AlphaTouch™ subscription. This is indicated by a BLUE star next to it. If you have more than one payment method on file, and wish to change which card is used as the "Monthly Service Card", simply click the GRAY star next to it. The star will turn BLUE, indicating it is the new card used for your monthy service charges. Click on the button next to the payment method you wish to delete. You will be presented with a confirmation dialog to ensure that you truly wish to delete that payment method. IMPORTANT: Be careful if deleting the payment method that is set as your "Monthly Service Card". Doing so will not cause any other payment to become flagged as the default Monthly Service Card. You must manually set a new card to take its place. Failure to do so may result in service interruptions. Once you have verified that you wish to delete the Payment Method, confirm that by clicking Delete Payment Method. You can view a full list of past transactions for your installation. Click the description text of the item you wish to view the full invoice for. Any optional feature add-ons that your installation is eligible for will show up here. You can easily view which add-ons you currently have enabled. You can enable or disable an add-ons at any time by toggling the Enabled/Disabled Switch. Enabling add-ons with an additional monthly cost will increase your monthly charge amount, and will be reflected in the "Subscription Information" area. NOTE: You must have appropriate "Billing" permissions to view or modify installation add-ons. This area will list the logs for the installation. The logs can be filtered by a variety of criteria by clicking on Show Filters. Any items that require your attention will be shown here. Such items include (but are not limited to) billing issues or issues with specific devices. You will be prompted for action, and instructed from there based on the particular issue. The AT700AS is a touchscreen door panel that is bursting with cutting-edge technology! Please make sure the package contains the following installation and mounting hardware. Panel Name: This is the name of the door station. It typically reflects it's location (ie, Front Door or Side Entrance). Panel MAC Address: The unique MAC Address associated with this item. It can be found on the back of the station. Buildings To Display: Select the installation building(s) you wish this unit to be associate with. All apartments & residents in those buildings will be displayed on the directory. Furthermore, only QR Access Codes that are associated with apartments in that building (or those buildings) will work from that door/entry panel. Play Voice Prompts? When set to 'Yes' the panel will audibly tell the visitor what to do in order to call a resident. Visitor Language Options: Select which language options will be available on this door station. Default Language for Text & Audio: Select the language you want to be used by default on this door/entry panel. The visitor can select another language if desired. Directory Format: Specify what information you wish to be displayed on the panel's directory screen, and how you wish to sort the directory. Resident Listing Format: Choose which part(s) of the Residents' names you wish to display and in which order. Custom Call Buttons: You can specify up to 4 Custom Call Buttons. For each button, specify an icon to display, a caption to appear on the button, and select the apartment(s) that button should call when pressed. To disable a button, simply remove all apartments from the call list. You can specify up to 3 different "action buttons" available to residents. These buttons are used to trigger any or all of the 3 relays located on this station. The three action buttons are referred to as "Primary", "Secondary" and "Tertiary". All 3 of these buttons can be configured in virtually the same way to provide your resident up to 3 action buttons to perform different tasks. Enabling An Action Button: Click on the appropriate action button tab. Click the gray/green slider to enable or disable this button. Trigger: You can specify the DTMF tone that the resident will use during a telephone call to trigger this action. The secondary and tertiary action buttons give you one additional option here. You can the option to trigger this action any time a call is placed. This may be used for an office building to tie into a stand-alone call system or chime. Pin this Action Button to the Resident Home Screen? If this button is pinned to the resident home screen, residents will be able to easily access this action button without bringing up the camera or receiving a call. This might be useful for a door-release button to allows resident to let themselves into the building if they forgot their key, proximity tag or access code. Relay A through C: Click the Grey/Purple toggle switch to enable/disable each relay for this action. Specify how long the enabled relays should delay before activiating and how long to stay active for. You can specify the ambient lighting level that must be reached before Assistive LEDs are activated.The assistive LEDs will help you see your visitors in lower-light situations. The Scale measures from 0 (pitch black) to 1000 (daylight). The best bet is to start in the middle at 500 and make adjustments accordingly. The lower the number, the darker it must get before the LEDs turn on. Idle Lighting Auto-On Level: Specify the level of environmental lighting required to trigger the unit's LED lighting fixture to turn on while the device is idle and not in use. Active Lighting Auto-On Level: Specify the level of environmental lighting required to trigger the unit's LED lighting fixture to turn on while the device is in use. Q. What are the ratings for the 3 Form-C Relays on the AT700AS? Each Form-C Relay built into the AT700AS is rated for 3A. Q. What types of Proximity Cards/Fobs can be used with the AT700AS built-in Proximity Reader? The AT700AS can support 13.56 MHZ and 125KHZ RFID Cards. Q. What are the Network & Internet Requirements for the AT700AS? Please refer to Network & Internet Requirements. The Alpha Communications® model ATRC100 AlphaTouch™ relay controller is designed to provide the analog relay gateway interface for the AlphaTouch™ system. The ATRC100 is built into a rugged high impact ABS plastic case, and is powered by a separate model PS-ATRC100POE (PoE type) or RASP-PI-3-PS (5vdc type) plug-in power supply. Each ATRC100 requires the model CT032AE6 relay control cable, CA-USBSERV10 serial to USB cable and KE-PWR5/2A power supply, as well as the required RY008AE and/or RY032AE addressable relay boards (and required CT032AEJ jumper cables). The ATRC100 features built-in Windows OS as well as full size HDMI interface, 4-USB 2.0 ports and audio output. PoE Input, Separate Power and Network Outputs. Ideal for situation where no plug in power is available. Connect the larger serial end of the CT032AE6 interface cable to the CA-USBSERV10 Serial to USB Converter, and connect that to one of the USB Ports on the ATRC100 AlphaTouch Relay Controller. Connect the smaller pin connector to Relay Board #1. Do not force the plug onto the connector, and make sure it is oriented and aligned correctly. IMPORTANT NOTE: The model# CT032AE6 cable is a basic 6 foot long cable. You may add additional exten- sion cables (to the 9-pin DIN Female connector end only), as needed, to a MAXIMUM of 200 feet in total. Do not cut or splice the CT032AE6 cable as it has integrated electronics to provide all of the necessary RS-232 level translation between the PC and the relay boards. Make sure any extension cables are high quality, shielded RS-232 type extension cables only. Failure to use the correct shielded cable or exceeding the 200 foot maximum cable length from the ATRC100 to the RY032AE board(s) can result in improper or erratic relay functionality. If more than one (1) Relay Board is used, you must connect a model# CT032AEJ jumper cable from the Serial Out connector from the 1st Relay Board to the Serial IN connector on the next Relay Board, continuing to add jumpers as additional relay boards are required. Each CT032AEJ jumper cable is only 12 inches long, so make sure the multiple relay boards are as close together as feasible for proper wiring connections, while still allowing room for wiring the appropriate number of output relay terminals. On the LAST Relay Board only, connect the model# KE-PWR5/2A 5VDC power supply, using the provided Female plug connector to the Serial Out connector. This 5VDC regulated power supply should be used only to power the relay board(s) and should not be used to power any other equipment. Make sure to align the connector properly to the 5 pins, as you did for the CT032AE6 cable. Connect one wire (COMMON WIRE) to either of the Common terminals marked COMM on the 1st relay board and jump this wire to either of the Common terminals marked COMM on the next relay board, and continue until all of the COMM terminals on all of the relay boards are jumpered together. You may use either of the screw terminals marked COMM on each relay board, as these are internally connected together on the board circuitry. 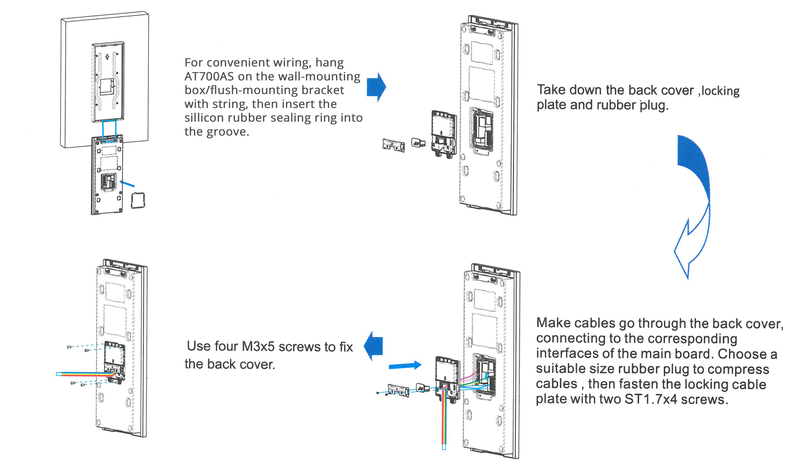 We provide two (2) COMM screw terminals to make it easy for you to connect multiples COMMON wires on each board. Connect this 'COMMON' to the wire that would normally connect to one side of all of the pushbuttons on a typical intercom or video-intercom entry door station. Once all of the relay boards are connected together, please determine whether or not your relay boards have been preprogrammed. If so, they will be clearly labeled with a relay board number. If not, you need to set the 'DIP' switches on each board to the Board# you wish to use to identify each board according to the chart below. CAREFULLY, slide the 'DIP' switches ON or OFF as indicated, using a small rubber or plastic (non-conductive) tool. You can install a maximum of 16 of the relay boards on each relay controller, for a total maximum capacity of 512 relays. In order for the relay controller to properly signal an individual relay to activate, you must individually number the relay boards (from 1 to 16). Since each relay is already numbered 1 to 8 (or 1 to 32) on each relay board, to trigger a specific relay to activate you need to know the Board# (1-16) and the Relay# and set that information into the appropriate area of of your cloud settings for the function you are performing. Make sure the 5VDC power supply that powers the relay boards is OFF (un-plugged) and make sure the serial cable CT032AE6 is un-plugged as well. Follow this same power-off procedure for adding or changing boards. Each relay board MUST be programmed with the correct BOARD# (from 1 to 16). Using the chart above (Fig. 2) and a small Rubber or Plastic (non-conductive) tool, gently set the 4 DIP switches into the correct ON/OFF positions, by sliding them Up or Down as required. DO NOT program the same BOARD# into more than one RY032AE board. You do not have to number the boards sequentially as they are mounted and jumpered, as long as each board has a unique BOARD#. See the chart above (Fig. 1) to see how BOARD# 1, 3, 7 and 16 are programmed (for reference purposes only). The 12-digit MAC Address of your relay controller. For a single-door application, DO NOT specify a Door # for relay controller sharing matrix. In order to specify which relay is triggered when a particular resident/apartment is called, you'll need to set this value in the settings for each apartment. Click on the Buildings menu item in the left-hand menu and for each building, click the dropdown menu and select Apartments, Residents and Devices.Then, select the apartment you wish to modify. In the General tab, please specify the Relay Board # as well as the Relay Position #. NOTE: If you do not see the relay board and relay position options, it is because you have not yet associated the relay controller with the door panel as described in step 1.